Being a good citizen and composting food scraps really isn’t that hard if you live in a house. But what if you live in a condo? You might think it isn’t possible (or maybe you even think it isn’t worth it) to do your part and compost your organic wastes. Let me show you how to do it and why it’s worth it. Apparently one-third of the trash we throw out is organic material. Local farmers can use this organic material to nourish the soil and grow more food, rather than loading up the landfills. Organic wastes that do end up in landfills decompose without oxygen and produce methane, a greenhouse gas (GHG). So it just makes sense to try to separate your organic materials out of the stuff that can be recycled or is no longer useful for any purpose and must be trashed. Living in a small space, the last thing you want to have is a bad odour lingering around, fouling up the place. I know that house-dwellers today often keep a small metal container in the kitchen and slowly fill it up through the day with orange peels, coffee grinds, chewy inedible meat bits (if you’re a meat-eater) and various other organic things that are carried out at the end of the day to either an outdoor composter in the garden or to the garage, in the case of folks who have a bin for curbside compost pick-up. If you live in an apartment or condo, however, you may not have the luxury of having an outdoor composter or even a balcony, in many cases. So what to do with the compost then? Some lucky folks have compost pick-up in the same place as they have had garbage pick-up for many years. Just in the past few months, my building has started to collect compost and the same waste management company that picks up our garbage, picks up the compost and takes it to another facility that specializes in composting. There are various easy-to-follow rules, such as “no plastic” in the compost bin, but otherwise, it seems just about any food waste or natural plant wastes can go in. We are allowed to put in meat scraps, sticks, tea bags, soiled paper (any clean paper is better off dealt with in the paper recycling process) and even pizza boxes. “What about the smell” you say? Even if you have a shared compost bin in a garbage room that you can take compost to at any time, you may not want to traipse down there with every banana peel or onion skin that your kitchen produces. It seems more efficient to collect up the compost for a few days and then carry it to the common garbage area. Here’s where things could get stinky, but they don’t have to. My condo provided each suite with a plastic carrying bin and our strata council recommended lining it with paper or newspaper to keep the bin from smelling. I guess some people store these on their counter, but let’s be honest, no one has enough counter space in the kitchen for this. 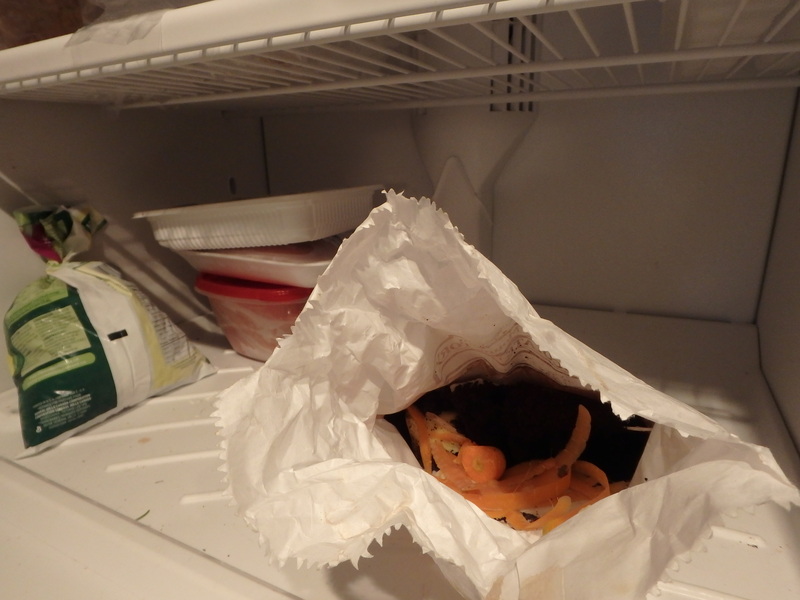 My solution is this: store your composted bits in a paper bag in the freezer. Yes, keep it frozen! I know most people use fabric bags for shopping, yet it always seems there’s a paper bag around. Freezing your compost is great because none of the organic wastes ever get to the point of being smelly. When the bag is full, you can easily carry it to the shared compost bin and either drop the organic brick out of the bag or even put the bag in with it, since soiled paper is an acceptable waste to put into the compost. I also like to keep a box of baking soda in the fridge and one in the freezer, so that during the time the foods are not yet frozen, any food smells are kept to a minimum in the refrigerator. Now, what if you are living in a condo that does not yet have any composting services? In this case, you will definitely want to use the freezing method, as it could be quite sporadic as to when you are able to unload your composted material. I would suggest calling your city hall and asking if there are any private facilities that accept compost in the area. Some even pay for this rich, organic gardening material. Another option would be to ask a friend, family member or neighbour, who lives in a house, if they wouldn’t mind including your composted materials in their bin. There is quite a lot of variation as to how much compost each household creates, since some homes compost lawn cuttings, others don’t have a lawn, etc. Most facilities that handle composted materials make money from what they collect, so it’s unlikely that any party would mind a household that lets friends add their materials to the mix. If your friend is a gardener, they’ll likely keep their own composter outdoors and be glad to take your organic wastes, but may not want any meat scraps to cut down on omnivore critters lurking in their yard. Most importantly, if your condo does not have a plan to deal with organic waste, be the one to help create one. Ask the strata council or homeowner association (HOA) what could be done and visit other buildings that have recently adopted a composting plan and ask if they have any tips for implementing one where you live. Jane Dunne is a Senior Editor at Specialty Technical Publishers and she is currently working on an update to Environmental Auditing: Federal Compliance Guide, which covers the requirements for landfills, recycling and electronic wastes in its Solid Waste module.